Does ASPluris support Two Dimensional Barcodes? Firstly you will need a units that has an imager rather than a laser. As an example the DT-X200 has a 10E model which uses a laser engine and a 20E which uses an imager. 2D scanners using an imager can read standard barcodes [in any orientation] and can read most 2D codes. If the client is just using the 2D code as an identifier ie just like a standard barcode but in a 2D code, then ASPluris supports that out of the box but needs an imager to read the 2D code. If the client has other data in the 2D code other than just the identifier [a QR Code which is a form of 2D can have more than 5000 characters] such as serial number or batch number or both or anything else, then we will need to understand the requirements. Once we know that, we will be able to match the functionality in ASPluris to the specific requirements. If you’re considering adopting a 3G/4G Wireless Wide Area Network [WWAN] solution for your rugged handheld terminals, here are the bands in use in Australia, and which carriers are using them. Not all rugged terminals are equipped with every band, so check the brochure or contact one our fantastic sales staff who will provide all the information you need to make the right choice. If your organisation is locked into using only a certain carrier, then let ASP manage your data plans if they need to be with another carrier. In general terms, the lower frequencies (700-900) are used for wide coverage, and the higher frequencies (1800-2600) are used to fill in coverage holes and to provide extra capacity. Telstra is already turning off 2100Mhz 3G and will reallocate that band to 4G. We’re not sure yet what the other providers are doing, but we expect that everyone will move to 4G or 5G eventually. What barcode symbology should I use? The best barcode to use depends greatly on how you’re intending to use it. Barcode fonts are great, but none of them are as simple to use as changing the font of a block of text in Microsoft Word. Code 39 is probably the simplest font, but you need to add an asterisk before and after the barcode. So, to print a barcode that says 1234, you need to specify it as *1234* – the asterisks are turned into special “start and stop” characters that are needed to create a valid Code 39 barcode. If you don’t add them, what you end up with may look like a barcode, but it won’t be valid and the barcode scanner will not scan it. Code 128 can create shorter barcodes than Code 39, but you need to add calculated check-digits into the code, so it’s not possible without some kind of helper application, or a dedicated barcode printing software package. If the correct check-digits and Code 128 specific start and stop characters (not asterisks like Code 39) are not there, the barcode will not be readable. UPC/EAN product barcodes are also available as a font, but they’re quite like Code 128 in that they need a special start code, a special code in the middle, and a special stop code, as well as needing a calculated check-digit. Again, leave the important bits out and it won’t work. Most other barcodes are similar, and not easy to create by hand. If you want to occasionally make a word document with a couple of barcodes in it that you’re going to type in by hand, AND you want to print it on an A4 sheet of plain paper in a laser printer, AND you don’t need anything in the barcode other than numbers and upper case letters (no spaces or lower case letters or punctuation), then a Code 39 font is probably easiest, since all you need to do is add an asterisk at each end of the code. Sizing the font to 24-point will probably give you something readable. ASP has our own Code 39 font – Just drop us a line for more information. If you need to print a few sticky labels, I think some of the cheap label-makers that office equipment suppliers stock have barcode capability. You need to think about the application as the durability of these labels may not be suitable – ASP can also guide you through that as well. At the other end of the scale, dedicated barcode label printers and label printing software can churn out quality labels all day long every day. Otherwise, if you just want to contact us and let us know exactly what you want to create and where the data that you want to print is coming from, we can probably come up with something workable for you. We’re currently writing an eguide on everything barcodes including QR Code but we hope this has assisted you for now. Please check back in a few months. Your business records could be as simple as a paper notebook where you record each item you sell. Or, you could be using a spreadsheet that you’ve developed yourself, or a Quicken, Reckon, or MYOB small business accounting program, all the way up to a full ERP (Enterprise Resource Planning) system, or a WMS (Warehouse Management System). Whatever you’re using, you need a system of inventory control. And inventory control starts with a stocktake. As we’ve described above, the biggest time and effort saver when stocktaking is collecting the stock counts electronically, and this usually means using barcodes. Barcodes are most easily read with a barcode scanner, and these can scan barcodes directly into a computer, or a shelf, row, or even a whole warehouse of scans and counts can be collected and then brought back to a computer. If you are keeping your business records on a spreadsheet on a notebook or PC, a stocktaking system might consist of a barcode scanner that plugs directly into the computer, and allows you to scan the item barcodes directly into the spreadsheet, then type in the count on the notebook or PC’s keyboard. This system has the disadvantage that you need to bring the notebook or PC to the stock. A step up from this simple solution would be to use a portable barcode scanner, which you take to the stock, scan the item’s barcode, then count the items and enter the count into the portable barcode scanner. After you’ve finished the stocktake (or a section of it), you bring the portable barcode scanner back to your notebook or PC and download all the collected data into your spreadsheet. If you’re using a small business accounting system, the barcode scanning options are pretty similar to the previous paragraph, except that many of these accounting systems don’t provide an easy way to import stocktaking data into the accounting system. Usually, stocktaking with these systems will involve downloading the collected stocktaking data to a text file on the computer, then using the accounting program’s import functions to bring the data in. Or, sometimes the supplier of the barcode system will provide a custom program that directly downloads the stocktake data from the barcode scanner into the accounting system. Full blown ERP or WMS systems are usually similar to small business accounting systems as far as bringing the stocktake data from the barcode scanner into the system. Once the stocktaking data is in your accounting system, you will be able to generate reports and analyse the data. You’ll be able to see how many of each item you’ve sold, whether there’s anything missing (ie the difference between the stock count and how many items the computer thought you had), and lots of other useful information. Do I need to physically count all my inventory? Client found response content type of ‘text/htim; charset=utf-8’, but expected ‘text/xml’. Go to the “Turn Windows features on off” in the programs and features section of the Windows Control Panel. 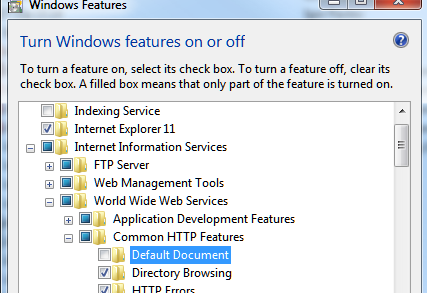 Untick the default document option and press OK.
Click the OK button, and once completed, open IIS and navigate to ASPluris V2.3, then click on the restart button. ASPluris does not restrict orders by time. Instead, the system downloads all orders that have not been completed. Uncompleted orders are those that have one or more lines that have not been picked. Yes. ASPluris is compatible with Windows Vista and later desktop operating systems, and Windows Server 2008 and later server operating systems. ASPluris is not compatible with Windows XP or earlier, or Server 2003 or earlier. A CAL is a Client Access Licence. You need one CAL for every barcode terminal that you will use at the same time. The ASPluris server has a “pool” of licences (ie CALs). Each time a terminal logs in, the server checks first to see if that terminal has already been granted a licence. If it has, the terminal is allowed to log in. If not, the server then checks to see if there are any “free” licences available. If so, that terminal is granted a licence, and the terminal is allowed to log in Otherwise, the terminal is refused. So, if the server has five licences (CALs), and five terminals have logged in, a sixth terminal will be refused. However, it is possible to “release” an existing licence, and the sixth terminal could then log on. The “released” terminal would then be refused. Does ASPluris need to be installed on the same server that Ostendo is running on? The main reason for recommending that ASPluris be installed on the same server as the Ostendo database is performance – ASPluris will run faster and more efficiently on the same server. If you install ASPluris on a different server, that server must have a TCP/IP connection to the server running the Ostendo database. Yes. You can either use a barcode terminal with 3G/4G capability, or use a “Pocket Wi-Fi Modem” from one of the mobile phone companies. The barcode terminal only needs to connect to the ASPluris server when selecting what you want to work on, and when updating. For example, if you want to perform a Stocktake, you need to be within Wi-Fi range when you select the Stock Count to work on, but you can then move out of Wi-Fi range while you do the count. You will need to come back within Wi-Fi range to Submit the count. How do I update the ABM Remote Transaction Processor (RTP)? The first thing to consider is whether you should update the RTP. Some updates to the service require the service and/or the scanner program to be updated as well, so you should take a whole-system approach to updates. Read the release notes for more information. How do I update the ABM service? The first thing to consider is whether you should update the service. Some updates to the service require the RTP and/or the scanner program to be updated as well, so you should take a whole-system approach to updates. Read the release notes for more information. How do I update the ASPluris scanner program? The first thing to consider is whether you should update the scanner program. Some scanner program updates require the PC service and/or the RTP to be updated as well, so you should take a whole-system approach to updates. Read the release notes for more information. What happens when two (or more) scanners count the exact same physical items in the same physical location during a stocktake? When a scanner counts an item, that count replaces the existing count. If another scanner counts the same item in the same location, the count from that scanner will also replace the count from the first scanner. For example, if you have a bin containing 56 of an item, and the first scanner counts 55, that’s what the ABM count will be set to. If another scanner then counts the exact same item in the exact same bin, but counts 57, the count in ABM will be set to 57, replacing the previous scanner’s count. What this effectively means is that the last scanner wins – its count replaces any other count. How does the Multiple Databases configuration option work? This option is used where, for accounting or other purposes, a company has two separate trading entities that share the same warehouse. A separate database for each trading entity is required. The Warehouse and Locations must be the same in both databases (as they share the same physical locations). ASPluris will draw the locations only from the first database. The ABM users should be the same in both databases. Product codes have to be different in both databases. The same product cannot exist in both databases. Orders (sales/receive etc) should have different prefixes for each database. From the scanner operator point of view, everything will work as if there is only one large database. Orders can be dispatched / combined and submitted etc. The operator can pick orders based on a customer which could be multiple orders from different databases. After picking, ASPLuris creates separate transactions for each database. For order grouping, the customer/supplier names have to match. Codes are looked up during the processing of the order so they can be different. ASPluris works out which database needs to be processed based on the order number or product code (transfer etc), then the transaction is processed as per normal. What does scanner error message “Unable to connect to company” mean? Since this message beings with a colon, the error is coming from ABM, not from ASPluris. This error can happen in two ways. The first is that the user may not have the correct access privileges to allow them to perform the transaction. This can be fixed by setting the correct access privileges in ABM and then refreshing the user list in ASPluris. The second way that the error can occur is a bit more difficult to explain. ABM has a hidden “control” database as well as the main SQL database. The control database is not accessible to ASPluris. When you add or remove users in ABM, ABM tries to keep these two databases in sync. Unfortunately, this sometimes fails, and if the user is in the SQL database but not in the control database, the user will be denied permission to write transactions to ABM, and that is what this ASPluris error message is showing. This synchronisation problem can usually be fixed by deleting the user with the problem from ABM then adding the user back in again. This should result in the ABM databases resynchronising. You can then refresh the user list in ASPluris. How do I interpret error messages on the scanner? If the first line of the error message begins with a colon, the error message has come from the ERP/WMS system rather than from ASPluris – the scanner is just passing the message on. I have forgotten the ASPluris administration username and/or password. What can I do? There is no way to recover a forgotten username or password. However, if you delete (or rename) the file that contains the ASPluris usernames and passwords, you will be able to log on using the default username and password. Unfortunately, if you have set up any other ASPluris administrator accounts, those accounts will be removed when you delete or rename this file. Navigate to the C:\ProgramData\ASP Microcomputers\ASPluris V2.3\ folder and locate the accounts.ds file. Rename this file by adding .old to the end of the filename. Can I order directly from the web site? In the meantime, please ring our friendly sales team on 03 9578 7600. How do I register ASPluris? Click on the Registration link at the bottom to display the ASPluris Registration Form. To register the service, or to enter a new registration code to enable more users or different modules, you need to provide the Hardware Fingerprint and the name of the company that the service will be registered to. This information, together with the number of users you want to have and which modules you want to use, will be used to create a Registration Code for this installation. When you enter the Registration Name and the Registration Code into the fields at the bottom of this screen, the ASPluris Web Service will be registered and the licenced number of users and the licenced modules will be enabled. Note that Registration Codes are specific to a particular program, the computer the program is running on, and the name the program is registered under. You cannot use a registration code on any other computer, or for any other program. Please see the section starting on page 2 of your ASPluris Installation Manual. What is a Regulatory Compliance Mark (RCM)? Australia’s electromagnetic compatibility (EMC) regulations impose compliance labelling and record-keeping requirements for the supply of almost all electrical and electronic products. The objective of the regulations is to minimise the risk of unintentional electromagnetic interference from products which may affect the performance of other electrical products or disrupt communications services. The EMC regulations require that, prior to supplying a product to the Australian market, suppliers must ensure that the product complies with the applicable standards. Suppliers can then apply a compliance label, which is called a Regulatory Compliance Mark (RCM) , an example of which is shown on the right. You can be assured that where compliance is required, ASP has taken care of it. If you are an overseas client, you can discuss your local regulatory requirements with us. What do I need to do about ISBN-13? For schools using ASP’s barcode scanners with SCIS, the simple answer is probably nothing at all. What we used to call just ISBN is now called ISBN-10, and this is the 10 digit code that is printed at the top of an ISBN barcode. An example is shown on the left below. The ISBN barcode on the right above is what people are calling an ISBN-13 barcode. You’ll notice that the ISBN-13 code is exactly the same as the number underneath the barcode. And if you look even more closely, you’ll see that the only difference between the two example barcodes is what’s printed at the top. So, as you can see, ISBN-10 and ISBN-13 are really just different ways of looking at the same thing. Every ISBN barcode with a number underneath that starts with “978” has both a 13 digit ISBN-13 code, and a 10 digit ISBN-10 code that is derived from the full 13 digit barcode number. Barcode scanners, by default, output the 13 digit number at the bottom of an ISBN barcode. If ISBN (or SCIS) mode is turned on, the barcode scanner will translate the 13 digit number at the bottom of the barcode into the 10 digit ISBN-10 code at the top. This is how your barcode scanner is configured now. Most likely, you only need to scan the ISBN code for use with SCIS. SCIS say that they allow either ISBN-10 and ISBN-13 codes to be used, so it really doesn’t matter if your scanner outputs the 10 digit code or the 13 digit code when the ISBN barcode is scanned. So, you really don’t need to do anything at all about ISBN-13 – everything will work now just as it has in the past. ISBN-13 example If you’re still reading, you’re probably thinking “why did they bother changing if ISBN-10 and ISBN-13 are really the same thing?”. The answer is that, sometime in the future, ISBN-13 barcodes that start with “979” (as shown on the right) will be released, and these codes do not have a 10 digit equivalent – they are 13 digit only. The good news is that because these barcodes start with “979” instead of “978”, your barcode scanner will already read them properly by just outputting the whole 13 digit code, which is exactly what you want. As long as SCIS accepts both ISBN-10 and ISBN-13 codes, it really doesn’t matter whether your barcode scanner outputs 10 digits or 13 digits, which is why you probably don’t need to change anything. However, at some time in the future, SCIS may change this policy. If they do, or if you use your scanner with ISBN codes and an application other than SCIS that only accepts 13 digit ISBN codes, you can easily turn off ISBN/SCIS mode. If you have an ASP Portable Barcode Reader or Z4 DataTraq, with either a wand or a Barcode Zapper, you need to press the FUNC key on the unit’s keypad. The display will then change to “Function:”. Press the 0 key then the 4 key, then press the ENTER five times until you get to the screen that says “Convert “978” EAN-13 to ISBN?”. There will be a Y or N in the upper right corner of the display – Y means ISBN mode is turned on, N means it is turned off. Press the NO key on the keypad to turn it off, then press ENTER twice more to return to the normal display. If you have an ASP Barcode Zapper plugged directly into your computer via USB or a keyboard connection, you need to find your original manual, turn to the page entitled “ISBN (SCIS) Conversion”, and follow the instructions to disable ISBN/SCIS conversion. If you need help reconfiguring your barcode scanner, please ring our support department (with your barcode scanner nearby! ), and we’ll be pleased to help you. If you have difficulties seeing consistent detail in the barcode, so will the optics in the ClassNet/ZipNet Terminal. All bars and white spaces must be clearly printed with sharp edges, and without dropouts. By dropouts, we mean that bars or spaces that are not of consistent and correct width. Remember that a slot reader such as that on the Terminal reads a tiny slice of the barcode (about 0.1mm wide). In the illustration, dropouts along the scan line have had the effect of narrowing one bar, and splitting another. Additional dirt or ink has also widened a bar. If there are problems with the barcode, you can be sure that Murphy’s Law will place these right in that slice. Step 1 – Make sure the scanner is sitting in cradle correctly and the power supply is connected. Step 2 – Press one of the two little black “charge buttons” on either side of the white disk on the cradle. Step 3 – The charging LED should come on. Step 4 – Once the batteries are completely charged, the red “Charging LED” will go off and the “Charge complete” LED will come on. Is the power supply plugged in, and is the mains power point working? Is the scanner sitting in the cradle correctly? If the LED on the cradle is red, the scanner is not sitting correctly. Try taking the scanner out and putting it back into the cradle. When scanner is sitting in the cradle and the �Charge button� is pushed, but the scanner beeps 3 times, the scanner is not sitting correctly. Try taking the scanner out and putting it back in the cradle. If the charge button is pressed and scanner beeps three times, the scanner has not been placed in the cradle correctly. Try taking the scanner out and put it back into the cradle. Check the cradle pins. Are they all aligned and all the same length? Are there any that are bent, pushed in or snapped? If so, you will need to send the scanner and cradle to ASP for service/repairs. Check the scanner contacts (scanner contacts for cradle pins). Is there any dirt, scuff or residue? If so, you can clean the contacts with a cotton bud with a little bit of methylated spirits. If you’re still having a problem, try unplugging everything and start over. How do I set or change the Start Date? The Start Date is the first date for displayed data on the Edit Scans screen. The easiest way to change this date is to click on the down-arrow just to the right of the year, which will display a calendar, as shown on the right. The currently set Start Date will be highlighted with a grey oval, while today’s date is shown inside a red circle. To set a new Start Date, just double-click on the new date, if it’s within the current month, or change to a new month by using the left and right arrows on either side of the month and year. You can also click on the month name, then select the month you want from the drop-down list that appears. The fastest way to change the year is to click on it – up and down arrow buttons will appear. There are also a number of keyboard shortcuts available – the Pg-Up and Pg-Dn keys move back or forwards one month, the Up-arrow and Down-arrow keys move back or forward one week, and the Left-arrow and Right-arrow keys move back or forward one day. The Home and End keys reset the date to the first and last day of the month. The ESC-key cancels date selection, and the Enter-key selects the highlighted day and exits back to the Edit Scan screen. There’s one final “nicety” for changing the Start Date – if you click on the up or down arrows at the far right of the Start Date field, the date will move backwards or forwards by the number of days set as the Display Period if you are displaying a single employee on the Edit Scans screen, or by a single day if you are displaying all employees. How do I determine the number of an IDTag? 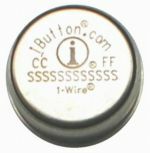 If you look at the bottom of an IDTag, you’ll see the iButton logo and web site address, and underneath that, two characters on the left (the CC in the photo on the right), two characters on the right (the FF in the photo), and then 12 more characters below that (theSSSSSSSSSSSS in the photo). The complete IDTag number starts with the two characters on the left, then the 12 characters below that, then the two characters on the right. For example, a typical IDTag number might be67000000C63165101. Note: IDTag numbers contain only the letters A to F and the digits 0 to 9, and are always sixteen characters long. IDTags always end in 01, DataTags always end in 0C, and TimeTags always end in 04. Note that if you have a DataTag Homebase connected to the PC running TimeSheet Express, and it’s configured in Data Collection Setup, you can insert the employee’s IDTag when the cursor is in the Employee ID field to enter the IDTag number automatically, rather than typing it in. What is the C-Tick Framework? Australia’s C-Tick framework has now been replaced with the Regulatory Compliance Mark (RCM) system. Will someone from ASP come and see me? It depends on the nature of your project, and we suggest you start by giving us a call. In most cases, time-consuming or intrusive sales visits are not required because our experienced Sales Staff will promptly and skilfully assist you by phone or email. They may also suggest a visit to ASP to get you away from day to day pressures, allow us to expose you to a variety of solutions, and allow us to call in our specialist staff as we help work out your real needs. In other cases a site visit, or multi person phone conference, will let us understand your specific situation and fast track to the best course of action. Back in 1977 when ASP was founded, we had business name after business name rejected. The problem was name similarities – everyone was using ‘Systems’ and ‘Group’ and ‘Computer’, and by then ‘Apple’ was already taken! Top of the list was ‘ASP’, so ASP it became (the line of least resistance for the clerk at the counter). How do I send equipment in for repairs? Please include a cover letter explaining any errors or faults you have experienced with the unit, or that you would like a general service. Don’t forget to include your contact details! We will evaluate the equipment, then contact you with a quote (either by fax, email or phone). Before we can proceed with the repair, you will need to let us know that you want to go ahead. If you choose not to go ahead with the repair, there will be a fee of $66 to cover our evaluation and administration costs. Extra charges will apply for additional units. Over the years a number of different types of barcodes, or “symbologies” have been developed for various applications. Each of these types has its strengths and weaknesses, and specific rules about its construction. A Barcode Decoder is programmed to “decode” these rules when it reads a barcode so that the output is the ASCII characters that the barcode symbol was intended to represent. An example is the supermarket codes called UPC in the USA, APN in Australia, JAN in Japan, and EAN in Europe. These are all numeric only codes related to each other. They allow identification of the country and manufacturer. Code 128 can represent numbers, letters, and even control characters. Code 39 can represent numbers and letters, and is common in libraries. ASP will be happy to assist you with make the most appropriate choice of symbology. Information which is encoded in its white spaces and black bars. These are decoded by a scanner’s engine or decoder according to preset rules, sent to the PC and appear as text on your screen. How do I print my own barcodes? You have several choices. If you need to produce runs of sticky barcode labels we recommend ASP’s Label+, a program for you for your PC that allows you print barcodes with your laser (best) or inkjet (adequate) printer. Use the program in conjunction with ASP’s range of special die-cut peel and stick label sheets. If you need to print barcodes within documents, use one of ASP’s range TrueType Barcode Fonts. Finally, if your needs are more “industrial”, ASP has a great range of reliable dedicated Barcode Label Printers using Thermal Transfer and Direct Thermal technology. As ever, give us a call to discuss your application, and we’ll be happy to advise. ISBN-13 barcodes are based on a book’s ISBN number. Found on the back of book covers or the inside cover of mass-market paperbacks, ISBN-13 barcodes are scanned at the cash register as well as at other points during distribution. ISBN-13 barcodes will replace the older Bookland barcodes beginning January 1, 2007. Like Bookland barcodes, ISBN-13 barcodes are EAN-13 barcodes with a 5-digit supplemental code. The EAN-13 portion on the left encodes the ISBN number itself and the supplemental code on the right is used to encode the retail price. Defined by ISO 2108, International Standard Book Numbers are a unique identifier assigned to each edition of every published book and book-like product. After January 1, 2007, ISBN’s will be a 13-digit number, as opposed to the older 10-digit format. How is an ISBN-13 barcode different from a Bookland barcode? ISBN-13 and Bookland barcodes are both used on books and look the same. The difference is the structure of the ISBN number used to make them. The older Bookland symbol was based on 10-digit ISBN numbers and always began with “978”. The newer ISBN-13 symbols are based on 13-digit ISBN’s. While they begin with “978” now, as the “978” number space is exhausted, ISBN’s beginning with “979” will be used. Important: Do not use a 979 prefix until directed to do so by an ISBN standards body. How can ISBN-10 be converted to ISBN-13? To convert an ISBN-10 to an ISBN-13, drop the last digit (the check digit) of the ISBN-10. The prefix “978” is added to the beginning of the now 9-digit number. The check digit is then recalculated using a mod 10 check digit routine. Can I just add the “978” prefix to my ISBN-10 to turn it into an ISBN-13? No. Although it is true that the ISBN-13 will be preceded by 978, the check digit (the last digit) will be dropped and another check digit will be calculated according to a new formula. This new check digit will then replace the old one. What do publishers do with the ISBN-10s they haven’t used up by January 1, 2007? Publishers should convert their remaining ISBN-10s to the equivalent ISBN-13 using the conversion formula. This change to ISBN-13 expands the numbering capacity of the ISBN system and alleviates numbering shortages in certain areas of the world. It also aligns the book numbering system for books with the global EAN.UCC identification system used to identify most other consumer goods worldwide. The geeky answer is that ISBN-13 barcodes are now GTIN-compliant, like other items in the retail and distribution channel. Will the barcode on the book be any different? The barcode itself will not be different. What will change is the printing of the ISBN number right above the barcode. Both the old and new barcodes are EAN-13 symbols with a 5-digit supplemental code. Who is affected? What has to be done? Everyone who deals with books will be affected, including publishers, distributors, retailers, and libraries. Publishers will have to make sure that books are printed with the new ISBN-13 in the proper places on the cover, and that the barcode also has the correct ISBN printed over it. In addition, the systems that a publisher uses will be affected; accounting, product information, production, supply systems, accounting, and contracts, for example. Similarly, retailers and trade partners will have to update all of the ISBNs stored in their databases, and may need to review their ordering systems, stock control, and accounting. Libraries will have to take into account all of the above, but will also have to keep old ISBNs on record in the event that a patron is searching for a book by ISBN-10. This means that library systems must be able to support both ISBN-10 and ISBN-13. However, this doesn’t mean that everyone has to replace all of the old ISBNs that have already been printed with the new ISBN-13. The recommended method is to use dual numbering to facilitate the transition. This means including both the ISBN-10 and the ISBN-13 on books until January 1, 2007. Then the ISBN-10 will be dropped from the book covers, and only the ISBN-13 will remain. What happens if a book is printed with the wrong ISBN on the cover? There are two options: the book can be reprinted or the incorrect barcode can have a correctly barcoded sticker placed over it. If books have already left the publisher with an incorrect barcode, distributors and resellers should be notified of the error as quickly as possible. Will books that have already been published need new ISBNs? No, an existing book’s ISBN-10 can be converted to its ISBN-13 counterpart using the conversion formula. The ISBN and barcode do not need to be changed until the book is reprinted. What is encoded on other magnetic stripe cards? Almost universally, track two will hold the card number, and where used, the card expiry date. What’s on the other tracks, if there’s anything at all, is totally up to the manufacturer. What information is stored on a financial card? Typically, a credit or debit card will use all three tracks, although only track two is needed for most non-bank applications. Track two contains the card number, the expiry date, and some other bank-specific information. Track one usually contains the card holder’s name, and the card number, along with other bank-specific information. The card’s PIN (Personal Identification Number) is not stored on the card. What information can be stored on a magnetic stripe card? The magnetic stripe card standard for financial cards (ie credit and debit cards) allow for three tracks, called, not surprisingly, tracks one, two and three. Track one can contain up to 79 alpha numeric characters, while tracks two and three can contain up to 40 and 107 numeric characters respectively. Note that track one is the only track in the financial card standard that can contain letters – the other tracks can contain numbers only. What are high coercivity cards? The magnetic strip on high coercivity cards (also called high energy cards) are made up of magnetic particles that are not easily altered by magnetic fields. For example, when a high coercivity card comes into contact with items such as a magnetic screwdriver or magnetic clasp, the information on the card is far less likely to be affected, unlike standard low coercivity cards (also called low energy cards). Although both types of cards can be read with standard magnetic stripe readers, different equipment is required to encode each type of card. How can I read a Medicare card? The card number and card expiry date information is encoded on track two, so you’ll need a track two magnetic stripe reader. The data on a Medicare card is arranged in four fields, each separated by an = character. The first field can be ignored, the second field is the first nine characters of the card number, the third field is the tenth digit of the card number, and the final field is the card expiry date, in ddmmyy format. Can a magnetic stripe reader read all the tracks on a card at once? Yes. Most magnetic stripe readers today are manufactured to read all tracks, and can be configured to output any combination of tracks, such as track two only, tracks one and three, all tracks, and so on. What’s a keyboard wedge interface? This interface “wedges” itself in between your keyboard and a PC, and makes the PC think that the barcode scans are coming from the keyboard. The Keyboard Wedge interface is less common nowdays because of the popularity of USB. What software do I need for a scanner on my PC? None if common interfaces such as USB or Keyboard Wedge are used, as the PC is “tricked” into seeing and barcode scan as keystrokes. If you need to use a less common interface such as RS232, ASP’s ASPKey+ Utility Program can likewise trick your PC into thinking barcode scans have been typed in. If unsure, please contact us for further advice. How do I connect the scanner to my PC? The most common connection is USB. Scanners with a USB connection simply plug into a USB port on your computer, and away you go! If your PC doesn’t have a USB port, a Keyboard Wedge interface is the next choice – it connects between your keyboard and your PC. Where can I download user manuals? The manuals for most ASP equipment are available from our web site here. If you need a manual that isn’t listed, please leave us a message on our Contact Us page. Please note that our manuals are in Adobe .PDF format – if you don’t already have the free Adobe reader, you can download it from Adobe’s web site. Because of the vast differences between various hardware / software manufacturers, we cannot possibly describe how to use our PBCRs for stocktaking. We can however offer this breakdown of the usual stocktake procedure. Check the PBCR is fully charged. ASP ships PBCRs with charged batteries but it is still a good idea to leave them charging, whenever not in use, to ensure as little as possible downtime. The units are charged by connecting to a powered Homebase (the green ‘charge’ light should come on) but leaving the PBCR itself switched to the off position. Clear the PBCR’s memory (Function 19). This should be done after every successful download also. Bring the PBCR to the Homebase and connect, via the Homebase cable. Check the green light comes on. Prepare the program to accept a stocktake (see your software suppliers manual). Begin the download (function 11). Check the data, if the data has errors, check the ASP web site Support page for further assistance. If all is correct, return to step 2 as required. Press the “function” key then the number “05”. This will bring up the delay settings. “Char delay” should appear. Please set this to “7” if it isn’t already and then press enter to move on to the next delay. “CR Delay” should appear. please set this to “2”. Then press enter 5 times and “keybd delay” will appear. Keyboard delay should be set to “8”. Then press enter. Now you should be back to the start. If the delays are still to fast go back into the delay settings and change your keyboard delay to “15”. Your computer most likely now only has USB ports. We can supply a USB Homebase, but you’ll need to check first that your Z4 DataTraq (or Portable Barcode Reader) will work with it. You can use ‘Function 00‘ to display the firmware version number – the number in the top right corner has to be at least 407. If it is, then you can just purchase the USB Homebase, plug it in and you’re set. If it’s a lower number, please contact our service department – your unit may just need a simple firmware upgrade. How many scans have I made? To check on the number of scans stored in memory, just press and release the FUNC key, then press and release the 2 key, then press and release the 3 key. This is called ‘Function 23‘. How do I know when memory is getting full? To check on the amount of free and used memory, just press and release the FUNC key, then press and release the 1 key, then press and release the 0 key. This is called ‘Function 10‘. This means that 29 characters of memory are currently in use for storing barcodes, and 31,083characters of memory are still available. Each barcode stored takes up the number of characters in the barcode plus one character of overhead to mark the end of each barcode. Why is my memory full? The Z4 DataTraq (and earlier models like the Portable Barcode Reader) store every scan into memory, even when the unit is plugged into the PC. To clear memory, just press and release the FUNC key, then press and release the 1 key, then press and release the 9 key. This is called ‘Function 19‘. The display will prompt you to confirm that you really do want to clear memory – press the YESkey to clear memory. Yes, of course! That manual, along with the manuals for most other ASP equipment, is available from our web site here. How do I use the hidden button? There is a “hidden button” on the front panel of the ZipNet and ClassNet Terminals. This button is located vertically down from the I in the name ZipNet (or the L in the name ClassNet) on the front panel label, and horizontally in line with the centre of the IDTag reading assembly. When you press and hold this button, several items of information are shown in turn on the unit’s display. Depending on the firmware version loaded in your terminal, the last three items may not be displayed. Which is better – horizontal or vertical read slot? There are arguments for either orientation. The horizontal slot is often used as a simple indicator of direction. For instance if a ZipNet Terminal was located on the right side of the entrance to a business, employees coming in to work might scan right to left to indicate they are clocking in, and vice versa when they leave at the end of the day. Some take the view that vertical swiping is easier. The choice is yours, but must be made when you order. What slot problems might we experience, and what should we do about them? Regardless of orientation, the card must be passed at an even moderate speed along the full extent of the slot. Instruct users to keep their card parallel to the bottom of the slot as they pass it through. Avoid rocking the card to ensure an optimal slice of the barcode is presented to the optics (this becomes more critical the higher resolution of the barcode). Make sure your card has rounded corners so that the card will not catch in the slot. The Terminal slot starts and ends with an ABS plastic “ramp” into a stainless steel bottom. The plastic is intended to be partly sacrificial to adjust to the exact height of the stainless steel section. If you experience any catching of the card as it passes along the slot this will make barcode reading difficult. Check and correct the cause. Perhaps the Terminal case has been incorrectly installed, or the plastic ramps requires wear or slight filing. What are the issues with scanning a barcoded card through a slot? When reading a barcode, it is critical that all bars are scanned. A slot reading mechanism such as that used on the ClassNet and ZipNet is simple to use and ensures the correct alignment of the barcode to the reading optics. Provided the card is correctly passed completely along the slot, all bars are scanned. The weakness is that each pass along the slot is discrete, as opposed to a handheld CCD or laser “auto” scanner which scans many times a second while held over the barcode. The auto scanner will also tend to “wander” over the barcode, so that if it is partially defective a successful read is still likely. The slot reader, however, always tries to read the same “slice” of the barcode. Barcode standards require a “Quiet Zone” of around 6.5mm at each end of a barcode symbol. This Zone must be blank and the same colour (generally white) as the spaces in the barcode. This Zone is required so that the barcode decoder can tell where the barcode symbol starts and stops. An undersized quiet zone may render a barcode unreadable, or readable only in one direction. What barcode symbologies do the ClassNet and ZipNet Terminals read? The ClassNet Terminal decodes both Code 39 and Code 128, up to 30 characters long. The ZipNet Terminal, as standard, decodes Code 39 only, but Code 128 is available as an option. Code 128 has the benefit of generally producing more compact barcodes. What is a suitable barcode resolution? Within reason, barcode symbols should be the lowest resolution (widest bars) possible for your application. This will minimise problems such as dirt on the card being interpreted as a bar, and the effect of drop outs. If you must use higher resolution barcodes, allow at least 3.25mm per character in a Code 39 barcode, remembering that there are 2 unseen characters, the start and stop codes. (eg. a code containing 14 visible characters, plus the unseen start and stop codes, should be at least 3.25 x 16 = 52mm long). Even with this general rule, it is important to carefully check the quality of cards, particularly those with higher resolution barcodes, by sample. What is the correct location for the barcode on a card? As the optic reads a spot about 0.1mm in diameter, and is located 10mm from the bottom edge of the slot, ensure the lines in the barcode are centred 10mm from the card edge to allow for “rocking” or other variations as the card is passed along the slot. What do I need to know about suitable barcoded cards? You will probably be using either a laminated card, or a printed plastic card. In both cases, the barcode symbol must be correctly located, clearly printed, of suitable resolution, and observe “quiet zone” standards. If using laminated cards, ensure there is a clear bond between the laminating pouch and the barcode. Avoid moisture bubbles – any problems usually result from moisture or low laminating temperatures. If using plastic printed cards, make sure the supplier uses a black ribbon only in the printed barcode (some colour printers use multiple passes of coloured ribbons, producing a fuzzy edge to the bars). In both cases, a magnifying glass or jeweller’s loupe is a handy tool for checking the quality of barcodes, or you can send a sample to ASP. How many scans can the terminal store? Approx. 30,000 characters are available for data storage. Storage memory is battery-backed to maintain the data when the power is off. To calculate the amount of data that can be stored between downloads, divide the amount of storage memory (ie 30,000) by the length of the barcode or IDTag number, plus an overhead of eight bytes for barcodes, or seven bytes for IDTags. The overhead consists of 6 bytes for the time and date, plus one byte to indicate the length of the scan, and one byte for the direction indicator (only for barcodes). For example, with 8 character barcodes, 1875 scans would fit in memory (ie 30000 / (8 + 8) = 1875), while 1304 IDTags would fit (ie 30000 / (16 + 7) = 1304). What’s the difference between a ZipNet Terminal and a ClassNet Terminal? ZipNet Terminals are designed for general time and attendance use, primarily in workplaces. ClassNet Terminals are designed for student attendance applications. ClassNet Terminals are designed to be polled by a PC once per period, and only allow each student to clock in once between polls. ZipNet Terminals allow multiple scans per employee between polls, and allow up to one week between polls. The two terminals use a slightly different polling protocol, and cannot therefore both be used on the one system. The ClassNet Terminal reads both barcoded cards and IDTags, while the ZipNet Terminal reads IDTags and optionally IDTags. Plastic barcoded cards are cheaper than IDTags, and (although it makes them dearer) can be printed with text, logos, photographs, a name and signature, and can sometimes be used for other purposes (ie library cards, or identity cards, etc). Plastic cards also wear out. IDTags are smaller, more robust, more secure (they can’t be duplicated, whereas a photocopy of a plastic card will scan as easily as the original), and conveniently attach to a key-ring. However, they are significantly more expensive. The first thing to check is the cards themselves. If there are obvious and heavy scratches through the bars, the cards may need to be replaced. The next thing to check is the slot – does it look dusty or dirty? Try sliding a soft cloth (not a tissue or paper towel) back and forth through the slot a few times. Finally, you could try cleaning the glass lens at the top of the slot with a cotton bud dipped in methylated spirits. If none of this helps, your terminal may need to be returned to ASP for repair or adjustment. Please contact our service department for advice. The manuals for most ASP equipment are available from our web site here. Why is my SSBT making a resonating beep (high pitch squeal) when I scan a barcode? Some people have described this as a ‘cricket sound’. The simple answer is that the scanner has successfully scanned the barcode, but for some reason has been unable to successfully send the barcode to the PC. This problem can be at either the cradle or scanner end. You may simply be outside of Bluetooth range. Bring the scanner back to the cradle and try again. Use the scanner’s locating feature (see above) to determine if the scanner is paired with the cradle. You may have scanned a barcode before the scanner had finished establishing a pairing with the cradle. If so, you need to wait for pairing to complete. If the green light on top of the scanner is constantly on (meaning pairing has occurred), but the ‘cricket sound’ still happens, your scanner may need to be reset (see above). The cradle’s USB cable may not be connected to the PC. Plug it in, and try again. If you are sure that the USB cable is connected correctly, try connecting it to a different USB port – preferably one that you know is working correctly. The cradle may have locked up, perhaps due to a momentary power failure. Try resetting the cradle using the procedure above. If the above doesn’t help, you could test on another PC. preferably one with a different Operating System, eg. Windows 2000, XP, Vista or 7. How do I perform Force Pairing? Please note – we do not recommend that you perform this procedure unless advised to by our service department. Please note that this procedure must only be performed if the serial numbers on the scanner and cradle are matching, and only if you have tried all other steps above in trying to get the scanner to pair with the cradle. When the cradle is flashing blue and the scanner is flashing green, place the scanner into the cradle. You will hear a single beep if the above step was performed correctly. If not, please repeat the first step. Press and hold both charging buttons on the cradle. If done correctly, you will hear three beeps. The cradle light will then turn red, and the scanner light will flash green rapidly. Release the buttons when this happens. The cradle will now automatically pair with scanner. At this stage, all lights and LED will be constant on. Why is my scanner not pairing? Is the scanner flashing a green LED? If not, then your scanner is off and needs to be turned on. Is the cradle flashing blue? If not, please check the cradle power supply. Are you within Bluetooth range? If not, try bringing scanner closer to the cradle. Have you got the right scanner pairing with the right cradle? Please check the serial number to see if they match. If not, locate matching serial numbers. Try resetting the cradle. If the scanner LED is constantly green and there is no power to your cradle for more than 10 seconds, try resetting the scanner. Try Force Pairing – note, only do this if you are sure the serial numbers are matching! How do I completely reset my SlimScan BT Cradle and Scanner? Disconnect both the USB cable from the PC and the Power Supply from the cradle. Is there a blue or red light on the cradle? If so, you haven’t disconnected either the USB cable or the power supply. Please note that if you do not disconnect both, the cradle will not reset correctly. If there is no light showing on the cradle, you can reconnect the power supply to power up cradle again. Open the battery compartment (you will need a small Philips head screw driver) and remove the battery on right side of the battery compartment. Wait ten seconds or more, then replace the battery and close the battery compartment again. We recommend removing only the right side battery, because the battery on the left has battery detection pins under it. If you remove the left battery, you must take great care not to damage these battery detecting pins when replacing the battery. It’s a lot safer to remove only the battery on the right! What does a green flashing light on top of my scanner mean? The green LED/light on top of the scanner indicates the current status of the scanner. None – the scanner is off. Flashing green – the scanner is trying to pair with the cradle. Constant green – the scanner is paired with the cradle. For more info on the scanner’s indicator lights, please see your SlimScan BT manual. How do I turn on my scanner? Where is the power switch? If the cradle has no power, or the scanner is not sitting in cradle and is left unused for more than 20 minutes, it will automatically power off to save battery life. To turn the scanner on again, either put the scanner into the cradle, or press the red scanning trigger on scanner. Why does my scanner beep when I press the button on the cradle? Don’t be alarmed – it’s meant to do this! The SlimScan BT has a built-in locating feature, to help you find your scanner if you misplace it. When the scanner is not in its cradle, press one of the (charging) buttons on the cradle – the scanner will beep three times to help you locate it. Please note that this feature will only work if the scanner is paired with the cradle. This is a good quick test to perform to determine if scanner and cradle are paired. Can I change the batteries? I have my own re-chargeable batteries. Unfortunately not – this scanner required specific batteries to work correctly and re-charge. Please contact ASP or your supplier. Why isn’t my SlimScan BT charging? Is the power supply plugged into the power point? Is the hand held sitting correctly in the cradle? Why is my SlimScan BT beeping periodically? This is a feature that indicates that the batteries are low and need charging. Why are the blue LEDs flashing? If this happens when the SlimScan BT is sitting in the cradle, it means that something is obstructing the “auto-sensor”. Move whatever is under the beam, or try moving the whole scanner and cradle slightly. How do I send a copy of my database to ASP? Sometimes, if we are unable to fix a problem over the phone, we may ask you to send a copy of your TimeSheet Express database to us via email. Open TimeSheet Express, then go to the File Menu at the top left of the screen and select Open Database. The screen will open in the folder that your current database is located in, and the filename of the current database will be shown near the bottom of the screen, above and to the left of the Open button. You need to find the file with the same name in the middle area of the screen. Once you’ve found it, click on the filename once with your left mouse button. Then, press and hold down the Ctrl key on your computer keyboard, and while you’re still holding it down, left-click on the filename and keep holding down both the Ctrl key and the left mouse button, then drag the mouse cursor onto a clear area of your computer desktop. This will copy the file to your desktop. You can now close the TimeSheet Express screens. Right-click on the database file that you copied onto the desktop, and select Send To from menu that pops up. Select Compressed (Zipped) Folder. This will create a compressed copy of your database on your desktop. Right-click on the compressed file and select Send To from the menu that pops up. Select Mail Recipient. Type support@asp.com.au into the To: field of the email. Make sure that your name and company name and details are in the email, then click on the Send button. We will acknowledge receipt of your database, so please contact us again if you do not receive an email from us in a reasonable time. PLEASE NOTE that you should not open or use TimeSheet Express, or download any data, once you have created the compressed database and sent it to us, because any changes you make to your database will not be made to the database you have sent to us, and if we have to repair your database and send it back to you, any changes you have made to your database will be lost. We will need to examine your database before we can provide you with any estimates on costs. Why isn’t TimeSheet Express collecting data? First of all, is TimeSheet Express running at the time that your data collection is scheduled? If it’s not running, it can’t collect data. Secondly, data collection won’t occur unless you’re at either the Edit Scans, Employees, Data Collection or Reports main screens. If you have any other screen open, particularly if you’re changing a setting or editing an employee’s details, you may change something that could affect the data collection, so TimeSheet Express won’t collect the data. What happens if I adjust times in the future? TimeSheet Express keeps two sets of times – the raw unadjusted scans, which show the actual time of each scan, and the adjusted times, which are created by the application of the Rounding rules, or by manual editing from the Edit Scans screen. Once adjusted times are created automatically, or are entered manually, no further automatic adjustments will be made. What this means is if you manually enter times for any day that you haven’t yet collected scans, when the collected scan data is eventually processed, the rounding options will not be automatically applied, because they would then override the manual adjustments you’d already made. What does ‘Database already in use’ mean? If TimeSheet Express is not shut down properly, or the computer is turned off or crashes while TimeSheet Express is running, you may get an error message indicating that the database is already in use when you know it isn’t. You can use the Compact & Repair Database function on the File menu to recover from this error. If the database is corrupted, this function will attempt to recover as much data as possible, and will warn you if any data could not be recovered. This function will normally only take a few seconds. If an employee scans a barcoded card or IDTag that has not been entered as an Employee ID for anyone, TimeSheet Express will not know what to do with the scan. When this scan is downloaded from the terminal, TimeSheet Express will display a message on the download log screen, listing any scans that have not been recognised. As shown on the log screen, unrecognised scans are stored in a file called misread.txt so that they can be reprocessed – see Reprocessing Unrecognised Scans in the manual or the help file for more information. The most likely reason that unrecognised scans occur is that a mistake has been made while entering the Employee ID on the Edit Employee screen, or a new employee has scanned their card or IDTag before they have been entered into TimeSheet Express. How can I re-use an employee ID card or IDTag? TimeSheet Express doesn’t allow more than one employee to have the same employee ID number. If you need to re-issue a previously used ID card or IDTag, you have to change the employee ID number for the previous staff member before you can re-use that ID number for a new employee. Click on the Employees button on the main screen, select the previous employee, right click, select Edit from the menu that pops up, and then change the Employee ID. We suggest you add something like an X, or perhaps the date of termination to the previous employee’s ID number, so that you avoid complications if an ID number has been re-issued multiple times. For example, an existing ID number of 12345 might become X12345, or perhaps 12345-1012 to signify that the employee left in December 2010. Once you’ve changed the ID for the employee who previous held that ID, you can add the new employee and re-use the employee ID for them. Can I download the TimeSheet Express user manual? Can we upload an Excel file into it directly or do we have only manual entry as an option? You need to save the Excel spreadsheet as a .csv file, and you can then import it using the Import Wizard. Does AssetTraq run .csv files? You can export and import data via .csv files, including your assets lists, locations and borrowers. Do we have the option of being fully portable? i.e wireless all the way. AssetTraq on portable barcode readers operates as a batch application. Connectivity to the database is required only when transferring the AssetTraq database to and from the scanner. Starting with V2.5, AssetTraq supports wireless data transfer to and from the scanner. All versions of AssetTraq support wireless connection to the database from a PC or a laptop/notebook computer. Do we have to save to a hard drive for storage or can we upload to a network/terminal server? The AssetTraq database can be stored on a local hard drive or on a server, as long as the PC running the AssetTraq PC program has connectivity to the database. We do not support the AssetTraq PC Program in a Terminal Server environment. Instead, we recommend installing AssetTraq on each PC that requires access to the database, and storing the database on a server. AssetTraq is licenced on a per PC basis, so you will need to establish how many PC’s will need to access the AssetTraq database. If there is just one user, then one licence is all that is needed. However, if the one user needs to access AssetTraq at multiple PC locations, then extra seat licences will be needed. Can you please advise how we transfer the data? To transfer an existing asset list into the AssetTraq PC program, save your assets list as a .csv format file, and then import to AssetTraq by using the Import Wizard. To transfer data between the AssetTraq PC program and the portable barcode reader, go to the Data Transfer section of AssetTraq and follow the instructions on the screen. What if two users try to edit the same asset at the same time? The AssetTraq PC program protects you from the unlikely circumstance that two users try to edit the same asset at the same time, by checking the database again before saving any changes. If the database is not the same as it was when details of the asset were displayed on the screen, AssetTraq displays a message explaining that another user has changed the database, and your changes will not be saved. As an example of why this might happen, consider if two users decided to change information for the same asset. Both users edit the asset, where the cost field and the serial number fields are currently blank, and on both screens, the same information is displayed. User 1 then changes the Cost field to $200, and saves the updated data. The asset information on User 2’s screen is now inaccurate, but User 2 doesn’t know – the cost field is blank. If User 2 were to save her data, the cost field would become blank again, so we can’t let that happen. Let’s look at the same situation the other way around – User 2 makes a change to the serial number field, and saves the updated data. The information on User 1’s screen is now inaccurate, but User 1 doesn’t know. If User 1 changes the Cost field to $200 and saves her data, she would update the cost field, but blank out the newly changed serial number field – again, something we can’t let happen. So, when the Save button is pressed, AssetTraq checks the asset data in the database, and only allows the save if the asset data is the same as it was when it was displayed on the screen. In circumstances such as this, one or the other of the users changes cannot be made, and AssetTraq is designed so that the changes made by the first user to press the Save button are saved, and the second user receives a message explaining why their data cannot be saved. The second user will then have to edit the record again, and make their changes again. Hopefully, the first user won’t quickly pull the carpet out from under the second user again! How do I return a borrowable asset from loan? Open the Borrow Assets window by clicking on the icon on the left side of the screen. Then, scan the barcode for the asset (or type in the asset barcode number, or select it from the list). A message will be displayed that the asset is on loan, and you can then click on the Return button to return the loan. See Loaning out Assets for further information. How can I quickly see what assets a borrower has on loan? Alternatively, you could display a Borrowers with Loans report, but this will list all borrowers, not just one. You should note also that when you’re loaning out assets on the Borrow Assets screen, all outstanding loans for a borrower are always displayed. What happens if I scan a borrowable asset during an Asset Check? The Asset is scanned in its proper “home location” – that is, the location that AssetTraq says it belongs in. The Asset is not on loan, and it is scanned somewhere other than its home location. The Asset is on loan, and it is scanned somewhere other than its home location. In case 1, the scan is recorded, and the Last Checked date will be updated when the data is loaded back into AssetTraq. It doesn’t matter if the asset is borrowed or not – if it’s in its home location, the Last Checked date will be updated. In case 2, the BHT-6000/8000 barcode scanner will display a message asking the user to return the asset to its home location. The scan will be ignored and the Last Checked date will not be updated when the data is loaded back into AssetTraq. In case 3, the barcode scanner will display a message that the asset is on loan, and the scan will be ignored. The Last Checked date will not be updated when the data is loaded back into AssetTraq. When performing the Missed Assets function, the BHT-6000/8000 will not list borrowed assets as being missed, since they are on loan. However, borrowable assets that are not on loan will be treated exactly the same as non-borrowable assets, and will be expected to be in their home location. To delete an Asset, select that asset on the grid, then right-click and select Delete from the menu that pops up. Note that if the asset is on loan, you will not be able to delete it – you must return it, then delete it. To delete a Borrower, select Borrowers from the Configuration menu, then select the borrower from the list in the Borrower’s Name box, then click on the Delete button. Note that if the borrower has any loans outstanding, you will not be able to delete them – you must return all the loans, then delete the borrower. To delete a Category, select Asset Category from the Configuration menu, then select the category, then click on the Delete button. Note that if any assets are set to this category, you will not be able to delete the category. To delete a Location, select Asset Location from the Configuration menu, then select the location, then click on the Delete button. Note that if any assets are set to this location, you will not be able to delete the location. To delete a Status, select Asset Status from the Configuration menu, then select the status, then click on the Delete button. Note that if any assets are set to this status, you will not be able to delete the status. You must make sure that there are no assets set to the Categories, Locations or Statuses you want to delete. If you need to delete a Category, Location or Status that is “in use” by one or more assets, you will need to find all assets that are using them, and edit those fields in the assets. Once the Categories, Locations and/or Statuses are no longer in use, you will then be able to delete them. Note that if you edit the name of a Category, Location and/or Status (for example, if you change the name of the Kitchen location to Lunch Room), all assets set to that Category, Location and/or Status will reflect the changes. How can I print Asset and Location barcodes when I haven’t entered my assets and locations yet? Click on the Print Barcodes icon on the left of the screen, and make sure the Using Database checkbox there is not ticked. Then, click on the Setup button, and then go to the Label Contents screen. Select Sequential Barcodes, and type the first barcode number into the Starting Number field, and the number of barcodes you want to produce into the Sequence Length field. Note that Asset barcode labels usually start with the letter A, and Location barcode labels always start with the letter L. When AssetTraq is generating barcode numbers, it uses five digits, starting with 00001. So, the first Asset barcode number that AssetTraq will generate will usually be A00001, and the first Location barcode number will generally be L00001. Note that Borrower barcode labels always start with the letter B, but we do not recommend you print them in this manner – instead, enter your borrowers, then print the barcodes from the main Barcode Printing screen, with the Using Database checkbox ticked. Once you’ve entered the starting barcode number and sequence length, click OK to return to the Barcode Printing screen, then click the Print button to print your barcode sheets. We suggest you only print a single sheet first, on plain paper, to ensure that you’ve set everything up correctly. See Printing Barcode Labels for more details. Can I download the AssetTraq user manual?